Examine patient from back, side, and front for posture. It is always important to look at not only the hip, but the joints above and below due to possible changes up or down the kinematic chain. From an anterior view: Look for alignment of the ASIS, iliac crests, and pubic symphysis. Also, look at the knees for any genu varum or valgum. At the level of the ankle, the arch height can be noted as well as any pronation or supination. From a lateral view: Compare level of ASIS and PSIS to assess for anterior or posterior pelvic tilt. Compare both knees for any genu recurvatum. Observe for any postural deformities such as sway back posture or increased kyphosis or lordosis of all spinal segments. From posterior view: Look for alignment of PSIS, iliac crests, and ischial tuberosities. At the level of the ankle, observe for any hindfoot varus or valgus. Any scoliosis can be observed from this angle as well. Examine the patient walking and watch for antalgic gait, stride length, foot position, average walking speed, stance time,stride time,and any other gait deviations such as circumduction,hip hiking, or steppage gait during the swing phase. Also, see if the patient is bearing weight equally through both legs or is favoring one side. During the gait analysis, it is important to check the patients balance. This can be assessed by having the patient stand on one leg(unaffected side) then stand on the other leg(affected side) and note the differences, if any. Balance can also be assessed during the quick tests. An assessment of active range of motion (AROM) and passive range of motion (PROM) must be performed on both the involved and not involved limb. This will help assess any differences in the two ranges and can give more information to figuring out the patient’s impairment. For example, if a patient has limited AROM and PROM is hip abduction to 30 degrees it could just be due to tight hip adductors. However, if the patients AROM is limited in abduction but PROM is within normal limits, this could indicate weakness of the hip abductors muscles. All range of motions can be assessed with the patient in supine except for hip extension range of motion which is measured in prone. Furthermore, hip internal and external rotation can be measured in prone if the therapist would like to compare both hips at the same time. While laying prone with the knees flexed to 90 degrees, IR and ER can be assessed at the same time on both hips. A quick assessment of muscle strength can be performed using break tests. This part of the exam will help identify if the patient has a muscle injury or weakness in any muscle groups. An assessment must be performed bilaterally. To assess hip flexors: While supine, have the patient flex the hip to 90 with the knee flexed to 90. Apply pressure to the proximal femur in the extension (caudal) direction. Direct patient to resist the pressure ("hold, don’t let me move you"). To assess hip extensors: With the patient in supine and the knee and hip flexed to 90 degrees, place one hand on the posterior thigh and the other hand on the planter aspect of the foot. Apply force in the cephalad direction and perform a break test. To assess hip abductors: While patient is supine with both legs extended, stand at the caudal end of the exam table. Place hands on lateral side of lower legs. Apply force in the medial direction and perform break test. To assess hip adductors: While patient is supine with both legs extended, stand at the caudal end of the exam table. Cross arms in shape of an X and place hands on medial side of lower legs. Apply force in outwards direction and perform break test. To assess hip external rotators: With patient lying prone and knees flexed to 90 degrees, stand at caudal end of exam table. Examiner should cross forearms into an X and place hands on medial side of each lower leg. Apply force laterally and perform break test. To assess internal rotators: With patient lying prone and knees bend to 90 degrees, stand at caudal end of exam table. Examiner should place hands on lateral side of ankle and apply force in a medial direction. Perform break test. In order to rule out other joint referring into the hip, the lumbar spine, sacro iliac joint and knee must be cleared. When performing these clearing tests, the therapist should be looking for the patient's pain (comparable sign). Lumbar Spine Clearing: (in standing) Bring patient through lumbar flexion (bending over to touch toes). If no pain is elicited, add neck flexion and then over pressure while patient is still flexed at lumbar spine. Then, bring patient into extension. If no pain is elicited with flexion or extension, bring patient through the lower lumbar quadrants. A left lower lumbar quadrant is extension, side flexion to the left, and then rotation to the left. SI Joint Clearing: Apply compression and distraction forces on the ASIS's while patient is supine. Knee Clearing: With patient supine, passively bring the knee through full flexion with over pressure and then full extension with over pressure. Palpation can help give any information about tenderness, pain, tightness, or any soft tissue abnormalities. While the patient is supine and prone, the therapist can palpate the PSIS, ASIS, sacral sulcus, and iliac crests to show for the alignment of the pelvis, sacrum, and general sacroiliac joint. Palpation of the greater trochanter can indicate a trochanteric bursitis or IT band tightness if tender to palpation. Furthermore, palpating the musculature including the adductors, quadriceps, hamstring, IT band, TFL, and gluteal muscles can give information about any muscle strains if tenderness or pain is found. Palpation of the pubic symphysis should also be performed in order to look for any muscle strains or fractures indicated by pain on palpation. General soft tissue abnormalities such as tightness or fibrotic tissue can be felt just through palpation. Observation of any bruising, muscular wasting, or joint swelling can also be assessed during palpation. The therapist should be looking for a reproduction of the patient’s symptoms during this part of the exam. The purpose of the passive accessory movements is to reproduce the patients comparable sign passively with the least amount of force, that is the lowest grade of movement. The passive accessory movements will help establish a benchmark for reassessment, as well as localized and isolate the site of the impairment. During the assessment of these movements, the therapist should be looking for R1, R2, P1, and P2. Many accessory movements can later be used as treatments. AP’s on greater trochanter: These are easiest to perform with the patient in side lying with the affected side up; however, it can also be performed with the patients supine. The position of the therapist is in front of the patient. The pads of the thumbs point towards each other and are anteriorly placed on the greater trochanter with the fingers spread around the greater trochanter. Oscillatory movements in an anterior to posterior direction are produced by the therapists body and arms. PA’s on greater trochanter: The position of the patient can be supine or side-lying. The position of the therapist is standing behind the patient or sitting down on a stool arm level with the patient. The pads of the thumbs are placed posteriorly on the greater trochanter with the fingers spread around the greater trochanter. Oscillatory movements in a posterior to anterior direction are produced by the therapists body and arms. Medial and lateral rotations: The position of the patient is supine with the therapist standing on the side of the affected hip of the patient. The therapist grasps the lower femur and upper tibia avoiding patella-femoral joint contact. Therapist should position themselves in a stride stance in order to use the trunk and body to produce the rotary movements. The hip is either medially or laterally rotated. Inferior distraction(longitudinal caudal movement): The position of the patient is supine with the affected hip flexed to 90 degrees. The therapist can either stand or sit on the edge of the mat table caudal to the affected hip. The therapists arms will wrap around the affected thigh with his/her forearms places on the most superior and anterior portion of the thigh. The therapist will then use their body to perform an inferior glide/distraction on the head of the femur. Lateral distraction: The position of the patient is supine with the therapist standing stride length on the affected side of the patient. The therapist grasps the upper medial thigh, hugging the thigh to his/her chest with the knee flexed. Once in this position the therapist glides the hip laterally. Movement is produced by gentle rocking movements of the therapist's body. Squat test: Therapist will instruct the patient to perform a proper squat. During the squat, the patient should report any pain felt in hip, knee, or ankle. The therapist is looking for a comparable sign. Single leg stance: Therapist will instruct the patient to stand on the uninvolved leg and then involved leg. This test is looking for reproduction of the patients pain. A Trendelenburg sign can be noted during this test as well (explained in special tests section). Hop test: Therapist will instruct the patient to single leg stance on uninvolved leg and then hop. Then, the test will be repeated on the involved leg. This test is looking for reproduction of the patient's pain. *The quick test are performed to see if they elicit the comparable sign(patients pain) and they are a good functional assessment. Faber's test:The patient lies supine, and the examiner places the patient's test leg so that the foot of the test leg is on top of the knee of the opposite leg (in the shape of a figure 4). The examiner than slowly lowers the knee of the test leg toward the examining table. A negative test is indicated by the test leg's knee falling to the table to at lest being parallel with the opposite leg. A positive test is indicated by the test leg's knee remaining above the opposite straight leg. If positive, the test indicated that the hip joint may be affected, that there may be iliopsoas spasm, or that the sacroiliac joint may be affected. Faber stands for flexion, abduction, and external rotation, which is the position the affected leg is in during the test. Trendelenburg's sign:This test assesses the stability of the hip and the ability of the hip to stabilize on the femur. The patient is asked to stand on one lower limb. Normally, the pelvis on the opposite side should rise (this would indicate a negative test). If the pelvis on the opposite side (nonstance side) drops when the patients stands on the affected leg, a positive test is indicated. If the pelvis drops on the opposite side, it indicates a weak gluteus medius or unstable hip on the affected, stance side. Ober's test: This test assesses the tensor fascia latae and iliotibial band for contracture or tightness. The patient is in the side lying position with the lower leg flexed at the hip and knee for stability. The examiner then passively abducts and extends the patient's upper leg with the knee straight to flexed to 90 degrees. The examiner slowly lowers the limb. A positive test is when the leg will remains abducted and does not fall to the table level, this could indicate a tight IT band. It is important to stabilize the pelvis during the test in order to ensure that the limb is being extended and abducted. Thomas test: This test assess the flexibility of the hip flexors particularly iliopsoas and rectus femoris. This test can also be used to assess a hip flexion contracture. The patient starts in a standing position with back to the the table and at buttock height so the patient can hug the affected leg first and bring the knee to the chest and then lean back to lay supine on the table with the examiners guidance. The examiner checks for excessive lumbar lordosis, which can be present with tight hip flexors and makes sure the pelvis is stabilized on the table. The patient holds the flexed hip against the chest. The unaffected leg is assessed to see if it is flush with the table after the examiner provides over pressure a positive test is failure of the test leg to fall level with the table, if there is any room under the leg then the patient is considered to have tight hip flexors. The next step is the straightening of the unaffected leg and then the examiner applies over pressure, if the leg falls in height then rectus femoris is tight. Hamstring length: This test assess the flexibility of the hamstrings. The patient starts in supine and brings one knee and hip to a 90 degree angle. 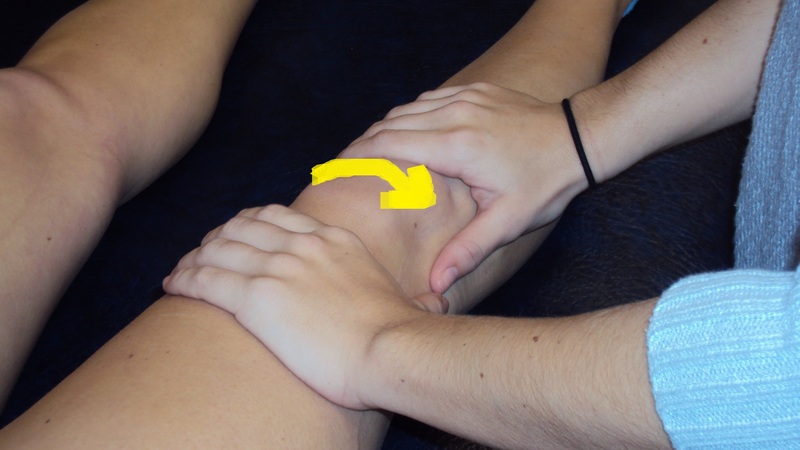 The patient actively extends the knee as much as possible. Then the examiner comes in and applies over pressure to the leg. The hamstrings are said to be tight in a male patient if the leg is less than a 70 degree angle and for the female patient if the leg is less than a 80 degree angle. It is important to test both sides to see what normal length is for the patient. Prone knee bend: This test assess for normal tension in the dura of the femoral nerve roots. The patient starts in prone and the examiner brings one heel to the buttock and holds it there. This test is positive if pain, a tension, or numbness and tingling are reproduced. Quadrant: This test is used to assess the hip joint, posterior capsule and ligament of the femoral head. The patient starts in supine and the examiner takes one of the patient's hip and flexes and adducts it so it faces the patient's opposite shoulder. As slight resistance is maintained the hip is moved into abduction(like a clock) while maintaining flexion of the hip. The resistance and movement is felt by the examiner and any irregularities of the movement such as bumps, pain or patient apprehension. The test is positive if there is a reproduction of pain. This tests causes impingement of the femoral neck against the acetabular rim and pinches the adductor longus, pectineurs,iliopsoas, sartorius and tensor fascia lata, so it should be performed carefully. Scour test: This test is used to asses the hip joint for a labral tear. The patient starts in supine and flexes the hip to 90 degrees, then the examiner internally and externally rotates the hip with abduction and adduction while applying a compression force down on the femur. The test is positive if there is any clicking, grinding,or pain which can possibly be due to arthritis,acetabular labrum tear,avascular necrosis, or osteochondral defect. If patient is complaining of any numbness, tingling, or paresthesias, the therapist can perform reflex, myotome, and dermatome testing of the lower extremities to rule out any lumbar spine or nerve involvement. 1. Banks K, Hengeveld E.Maitland's Clinical Companion. Italy:Elsevier;2010:517-548. 2. Magee D.Orthopedic Physical Assessment.St.Louis,MS:Saunders Elsevier;2008:664-724. 3. Bandy W,Reese N.Joint Range of Motion and Muscle Length Testing.St Louis, MS:Saunders Elsevier;2010:473. 4. Gulick D.Ortho Notes Clinical Examination Pocket Guide//.Philadelphia, PA:F.A.Davis Company;2009:190-192.